A retired officer has told Oscar Pistorius’ murder trial that police followed a “trail of blood” up the stairs after being called to the athlete’s house in Pretoria. 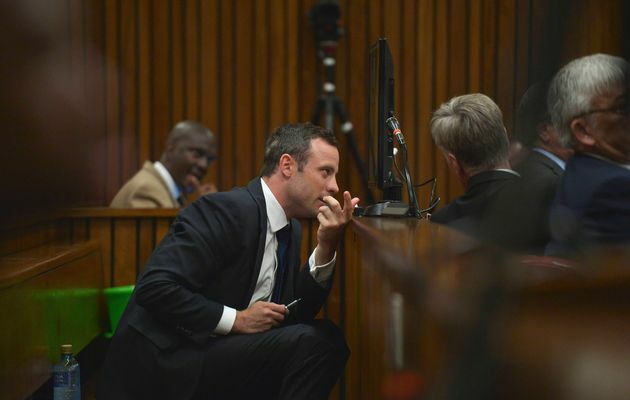 Col Schoombie van Rensburg said he found Oscar Pistorius in a “very emotional state”. Earlier, a forensics expert defended police handling of evidence. Oscar Pistorius denies murder, saying he shot his girlfriend Reeva Steenkamp on February 14, 2013, after mistaking her for an intruder. The prosecution says he tried to beat down the door and then fired the gun following an argument. Col Schoombie van Rensburg, who was initially in charge of the crime scene, said he immediately gave orders for it to be secured. Defense lawyer Barry Roux has said that evidence from the scene subsequently went missing. When Schoombie van Rensburg arrived, he found Oscar Pistorius in the kitchen, pacing up and down. The former officer asked the athlete what happened, but “he was very emotional. He didn’t understand”, Col. Schoombie van Rensburg said. He described a “trail of blood” leading up the stairs and spots of blood on chairs in the living room. The court was shown photographs of the crime scene, which showed blood on the stair walls. Schoombie van Rensburg said there was a spatter of blood on the first floor landing, with some blood on the wall next to his trophies. He said he found the toilet door, through which Reeva Steenkamp had been shot, locked. Schoombie van Rensburg resigned from the police force in December after nearly 30 years of service. He said when he entered Oscar Pistorius’ house, he found Reeva Steenkamp’s body lying in a pool of blood covered in white towels and black plastic bags. There was another woman there, Carise, the daughter of estate manager Johan Stander. She told him Oscar Pistorius had phoned, saying he needed their help. Johan Stander also told him that she and Oscar Pistorius used the plastic bags and a towel to stop the bleeding after Reeva Steenkamp had been shot. The prosecution has been attempting to cast doubt on parts of Oscar Pistorius’ story, including his claim that he was wearing his legs at the time of the shooting.